If you need to update Tags for any of your Shopify items (like Products, Customers, Orders or Blog Posts), then you can do it quickly with the Excelify. Let’s take a look at how to do it. We will use Products as an example, but the same will apply for other items that have Tags in Shopify store. Export Products you need to update. Update the “Tags” and “Tags Command” columns. First, you will need to export the Products that you wish to update. In the Excelify apps Export section select the checkbox “Products“, no other checkboxes are needed. 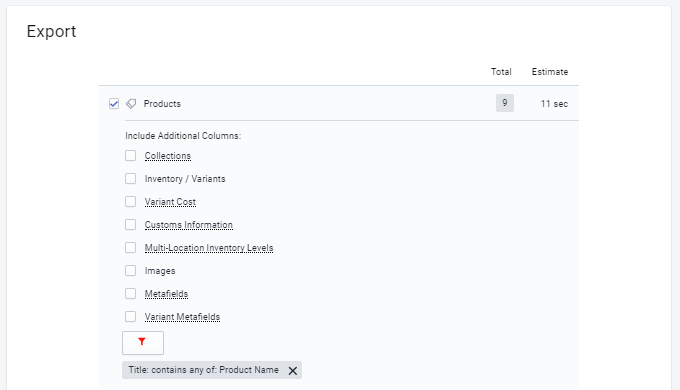 Then you can click on the filter icon to apply filters so you only export Products that you wish to update not all Products. Press the “Export” button to start the Export. When the export is finished you can download the exported file by clicking on the button “Download Exported File“. Now, you will need to chose what you wish to do with your tags. In the exported file you can see that the column “Tags Command” has the value REPLACE for all Products. 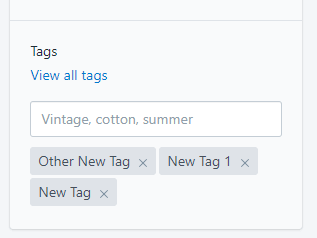 MERGE Tags Command will add Tags to existing tags. It means that you don’t need to list all the tags in the import file, you can import those which you want to add. If some of the tags you are importing already exist, then the app will ignore it. The DELETE Tags Command will delete the Tags that are listed in the import file. If the listed tag will not exist, then the app will ignore it. All Tags that are not in the file will not be touched for Products with the Tags Command DELETE. The REPLACE Tags Command will replace all existing tags with the tags from the import file. Use this method to maximize the import speed, because if you will use MERGE, it means that the app will need first to load existing tags which takes additional time. When you have selected Tags Command that fits your needs you can update the “Tags” column accordingly as I have in the screenshots above.